A federal jury found former BP executive David Rainey not guilty of lying to investigators in connection with the 2010 Deepwater Horizon oil rig disaster that spilled oil into the Gulf of Mexico. Rainey, one of the few people facing criminal charges in connection with the spill, was charged with making false statements about the quantity of oil spilling into the Gulf following the explosion aboard the BP rig. Defense lawyers argued his figures were honest estimates and that Rainey had no reason to lie. The government’s initial estimate for the spill was 5,000 barrels a day. A federal judge overseeing civil litigation in the case ruled earlier this year that the actual rate was over 36,000 barrels a day, amounting to approximately 3.19 million barrels before the damaged oil well was capped. US District Judge Kurt Engelhardt agreed with the verdict. He had previously dismissed charges against Rainey of obstructing a congressional investigation, partly because members of Congress could not be compelled to testify. A trial is still pending for BP well site leaders Robert Kaluza and Donald Vidrine, charged with manslaughter over the 11 deaths caused by the explosion aboard the Deepwater Horizon, reported AP. 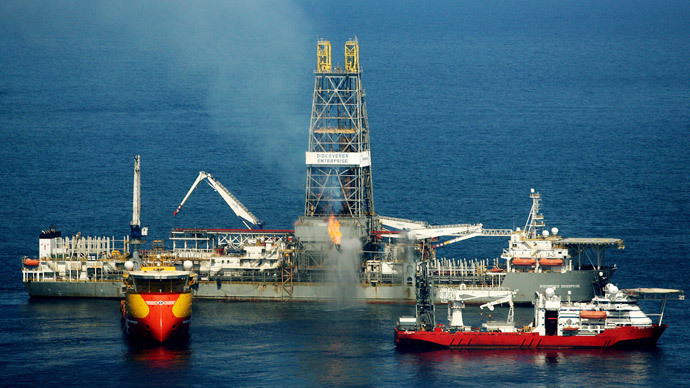 Anthony Badalamenti, a former manager for Halliburton Energy Services – a BP contractor on the rig – was sentenced to one year of probation for destroying evidence in the aftermath of the disaster. BP's former engineer Kurt Mix was convicted in 2013 of deleting text messages about the oil flow, but his conviction was overturned because the jury deliberations were tainted by outside information. BP is still facing fines up to $13.7 billion from the disaster, and has spent over $28 billion in spill response, cleanup and claims. Halliburton agreed to a $1.1 billion settlement with residents and businesses along the Gulf, removing the corporation from most remaining liability as a result. The April 2010 disaster affected around 16,000 miles of coastline and resulted in the death of 8,000 animals, according to the National Park Service.